They Open the Door to More Sales! 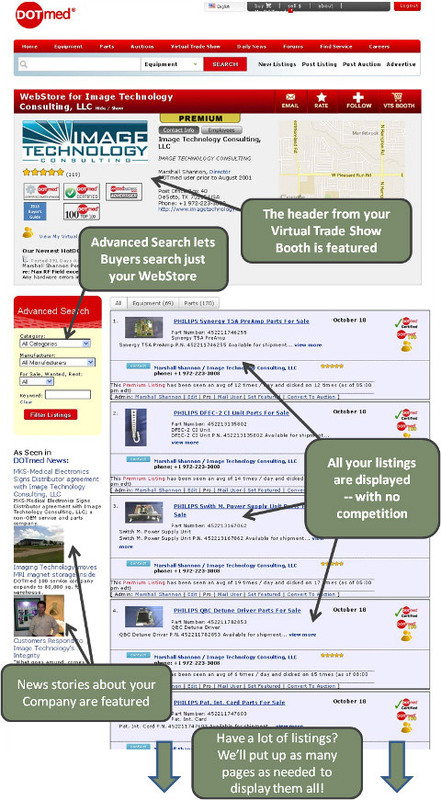 A Company WebStore showcases all your DOTmed listings in one location without any competition. Buyers get a clear view of your entire inventory so you maximize your presence online and promote cross-selling. To see examples, please click here. We'll automatically update your inventory every time you change your DOTmed listings. There's a "Visit My WebStore" link in every one of your listings. You can send your entire WebStore to potential buyers, so they'll see your inventory, and yours alone. You can open a WebStore for just $100/month and you can post up to 300 listings in it -- this WebStore Package also comes with a Standard Virtual Trade Show (VTS) booth. Want to post more than 100 listings? Start with an Executive Level Premium Package for $150/month, that comes with a Premium VTS Booth and 400 listings. WebStores come standard with all Elite Upgrade Packages which allow you to post from 500 or more listings and come with additional selling tools. You Company WebStore enables one person to post listings and all those listings display that person’s contact information. You can, however, purchase additional WebStore posting rights for other salespeople. Their listings will run in your Company WebStore so everything stays under one roof, but their listings will show their unique contact information. When you add additional WebStore users, your Sales Manager will get a Sales Command Center so he can see all activity at a glance. Additional users are just $75 per month (equivalent to a Pro Upgrade $50 + WebStore $25). Thank you for the follow up. Yes, I spoke with David, my Project Manager, yesterday. He was extremely helpful and answered all of my questions. He walked me through all of the necessary steps to get our web store up and running. We are very pleased with your service and staff thus far. It's nice to see a company that cares about their customers, thank you for all of your help.